These syringes are ideal for use with our syringe pumps for a wide range of research laboratory applications, including microinjection. We offer a variety of microsyringes with gas-tight luer tips and gas-tight Teflon luer lock tips, as well as syringes with replaceable needles. 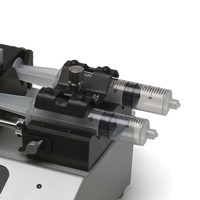 These laboratory microsyringes work with a variety of syringe pumps, like the UMP3 UltraMicroPump, the MMP and DMP Manual Microsyringe Pumps, the Aladdin pumps, and other syringe pumps. We offer a broad range of fluid handling equipment.